Whenever I've spoken to or heard from somebody who worked directly with Marc Davis, the most common way I've heard him described is "extremely serious". This seems to directly contradict his reputation as the master of zany visual comedy and weird jokes, but the description is pretty consistent. Despite the obvious levity he brought to project after project, it's clear that he thought hard about the medium he was working in. Here's a guy who studied to be an artist in a traditional mold who was brought into Disney in the 30s due to his superior drafting skills as part of a classically trained support group behind Ham Luske, Jack Campbell, and Grim Natwick in the creation of Snow White. Snow White, the most complex, subtle animated character ever attempted at Disney at that time, started Davis off on a career path of animating leading ladies: Cinderella, Alice, Tinkerbell, and Aurora in Sleeping Beauty. He had some opportunities to show some range too: Brer Rabbit, Cruella deVille, and Maleficent hint at Davis' extraordinary skill, but he largely was given technically demanding women's roles while artists like Ward Kimball and Frank Thomas cut loose with comedy characters. In later interviews, Marc never had too much to say about his leading ladies. He had very complimentary things to say about Sleeping Beauty's effort and design, and I've often wondered if his dual role in that film (animating both Aurora and Maleficent) was a result of some kind of bargain to land a better character role. He left feature animation after his work on Chanticleer bottomed out. 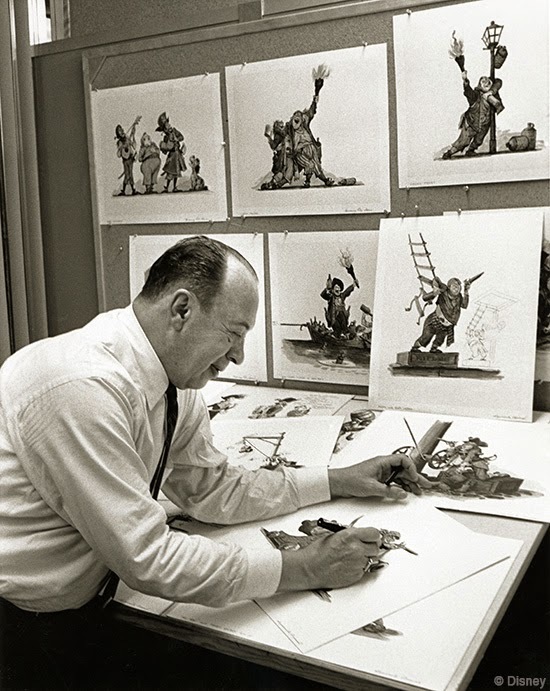 excerpt from his autobiographical "A Thumbnail History of Marc Davis"
In contrast, Marc characterized his time at WED Enterprises as the part of his professional career where he was truly satisfied. He was, I believe, the first of the Imagineers to really take a critical look at what made Disneyland tick. After Walt sent him out to look at the place and gather ideas, he made it a habit: careful observation of how people acted and reacted inside the parks. The lessons learned in Enchanted Tiki Room he carried over to Country Bear Jamboree. 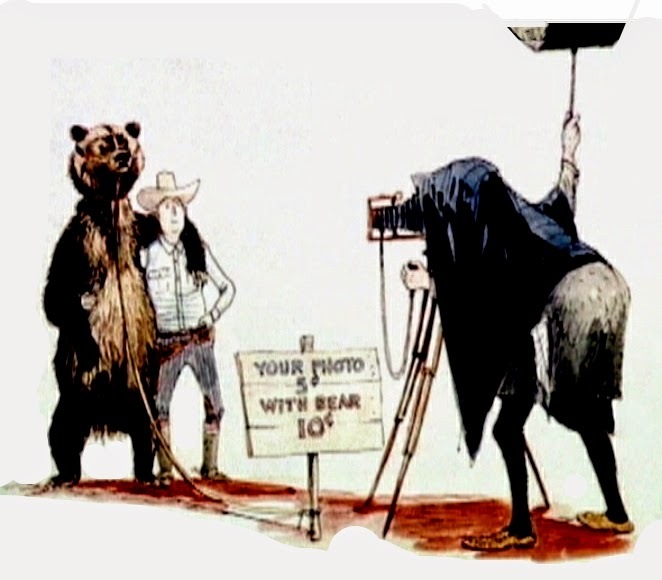 Lessons learned in Country Bear Jamboree he carried on to America Sings. The enjoyment he took in this new medium, and level of serious thought he devoted to it, is evident in much of his work. You don't come up with powerfully communicative, funny stuff like the Trapped Safari at Jungle Cruise without putting a lot of thought into how to pull it off. But I think what Marc really wanted was to be able to do what Claude Coats did. 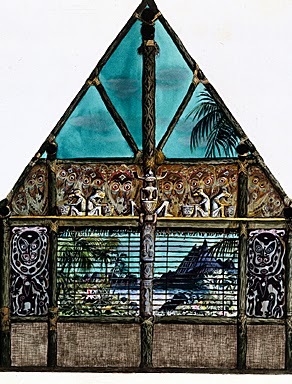 It was the fusion of Claude's sensibilities for atmosphere and color and Marc's sensibilities for comedy and visual communication that elevated Pirates of the Caribbean and Haunted Mansion. But if you really have to choose a style that makes those two attractions work, it's Claude's. Marc learned the power of a richly developed atmosphere from Claude, and Western River Expedition was his chance to put his learning to good use and do it all himself. So despite their obvious affinity for each others' styles - Marc and Claude continued to work together, on 20,000 Leagues Under the Sea and again on Enchanted Snow Palace - Marc would always get a little cagey in describing Claude Coats in later years, and I think this is why. You can call it jealously if you like, but Marc wanted to offer more than gag and character designs. So it's interesting to examine how things Marc always said about Pirates of the Caribbean ended up being transposed in transformed ways into Western River Expedition. He praised Coats' haunted grotto in Pirates as being "very effective", so Western River has two caverns, but each one with a very different effect. The first cavern takes the place of the "time travel" conceit from Pirates in favor of a more artful approach to drawing us into a fantasy. Rock formations in the opening cavern suggest one Old West image after another, and as we pass each, a piece of the Western River Expedition theme begins to play one part after another until there is an entire musical piece. In this way, the Old West of the prairie, cowboys and indians, and Dry Gulch seems to come out of our own subconscious associations as we see seemingly familiar shapes in rocks. There's no need for a big pile of cursed pirate gold because Davis artfully prompts us to make the leap into fantasy ourselves. The second cavern repeats the spooky atmosphere of the Pirate caves but this time adds all of the waterfalls which make the Disneyland caverns so memorable. I think the idea of motivating the waterfalls as being the result of a flash flood, thereby making them a direct threat to riders, is ingenious. And then there's the trip up the waterfall. Marc always called out Walt's trip up the waterfall at the end of Pirates as an element he pointedly did not like, so what's it doing in Western River Expedition, the dream project he had total control over? I think Marc probably noticed something about the "Up the Waterfall" scene which can still be observed in the park today, which is that people expect a big payoff for going up the waterfall. They raise their arms in anticipation of a big drop. If you read his objection to the scene again, you'll notice that his specific complaint is that guests "sit there wondering what the hell [to] do next". This is why using the trip up the waterfall to build suspense at the climax of the ride solves his stated objection. Western River Expedition cleverly uses the up-the-waterfall gag to raise suspense for a coming confrontation as our situation goes from bad to worse. He turned an (apparent) liability into an asset. Other items from Pirates of the Caribbean got a total rethink. The idea of turning the fiery finalie into a natural disaster is an interesting one, but Davis zeroed in on the beautifully effective "swaying timbers" scene for expansion into literally an entire burning forest about to come crashing down onto the boats. Western River was as much an experiment to place every element from Pirates into its most dramatically effective order as it was a plan to "outdo" it. Perhaps they would have seemed redundant sitting next to each other in the same park at first, but I think Western River Expedition was up to enough genuinely new stuff to earn a place as a standalone piece. Oh, and about Pirates of the Caribbean in Florida. I don't think it's necessarily a coincidence that when Marc was tasked with designing a cut down version of the attraction for Magic Kingdom that the stuff he excised is the stuff that would have been most redundant with Western River Expedition. Ride up the waterfall? Gone. Slow atmospheric build to the start? Gone. Slow crawl underneath burning timbers? Gone. If anything, the fact that the FL Pirates dispenses with all of the atmosphere building and gets us right to the meat and potatoes of the ride - the town under siege - makes even more sense considering exactly how much of Western River was supposed to be atmospheric vamping. So, yes, the pitifully small budget contributes as well, but in 1971 and 1972 when designs were underway, Western River Expedition was still officially being prepped for construction at Magic Kingdom. Davis seems to have been going out of his way to make both attractions complimentary instead of competitive. It's unfortunate that Pirates was left holding the short end of the stick in 1973, but that's what happened. I suspect we'd be having a very different discussion about this if WRE got off the ground. In fact, nobody ever seems to mention that if Western River Expedition was Marc's first stab at reworking Pirates, and Florida Pirates of the Caribbean was his second, he went back and did it all a third time: for Tokyo Disneyland, in 1983. Tokyo's Pirates makes for very interesting direct comparisons for those who know Disneyland's well and with Marc in mind. This time he got to leave in the Blue Bayou, shortened but dramatically redesigned the haunted caves, lengthened the town sequence and the munition storehouse shootout, but dropped the trip up the waterfall. I'm going to such lengths to point all this out because if Marc is mentioned in the fan community these days it's for one of two things: conceiving crazy character gags and for saying "[Walt Disney] didn't like the idea of telling stories in this medium. It's not a story telling medium. But it does give you experiences. You experience the idea of pirates." That's a brilliant quote, but as far as Marc is concerned that's just the tip of the iceberg. Because the two attractions Marc had total control over, Country Bear Jamboree and America Sings have heavy on character gags but light on atmosphere, and because of that perniciously complex quote about story, Marc often gets painted as a guy against all forms of in-park storytelling, heavily lobbying for attractions full of crazy gags and characters. Nobody ever points out that he began to push Claude Coats-style atmosphere heavier and heavier in 1969 and 1970. The gorgeous interior of the Florida Tiki Room? That's Marc Davis. The deep, dark queues of the east coast Pirates of the Caribbean? That's Marc Davis. The fact that he designed the entirety of the Florida Jungle Cruise, which is the Jungle Cruise most devoted to atmosphere, is not widely known. In fact, the 1971 Jungle Cruise is the ride where he began to paint Coats-style scenic layouts, some of which you have seen in last week's article. Every rock and every figure in that Jungle Cruise is placed exactly where he wanted it. Enchanted Snow Palace, too, was built on the rock of atmosphere. A shimmering symphony of Yale Gracey light effects, Buddy Baker music and eerie but beautiful atmosphere, it was intended to be an adult counterpoint to It's A Small World. Yet this was designed nearly concurrently with America Sings, which is wall to wall crazy animals. The guy had range. In other words, it's been streamlined into the mainline narrative of his work at WED as the master of random gags. But if we take Marc at his word, then his ideal attraction concept, his personal baby, is a ride with a rigorously conceived dramatic arc, the best kind of theme park narrative. Marc's right: it's not a story with traditional leading characters and a dramatic denouement, but I think Western River Expedition represents one of the most carefully put together "theme park stories" ever. It's not book or film storytelling, but it is Disneyland storytelling. This is why I've worked so hard to give a complete, correct version of the experience of the ride. Because I think understanding what it really was supposed to be is a key to understanding the way Marc thought about a medium he loved. I mean, he could have gone on after his WED Enterprises career ended and worked with independent animators like Don Bluth and Richard Williams, but he didn't. What he kept doing was designing characters and concepts for Independent Theme Parks like Circus World and designers like Gary Goddard. Disney be damned, he kept working in his chosen field. In this respect, the tragedy of the failure of Western River Expedition's development cycle is compounded. We were not just denied a great attraction, but a terrific insight into one of WED Enterprises' most engaged critical thinkers. I hope these articles have gone some way in the direction of helping to improve the understanding about and discussion surrounding this ambitious project and its primary creator. Untangling the webs of misinformation around Thunder Mesa has been daunting but keenly personally rewarding. Western River Expedition may never get built, but in design and conception it's reams and reams of intensely valuable, brilliant thought about the possibilities of a medium that could use a few more masterpieces. The true tragedy is that this is exactly the type of attraction that Disney needs right now. Everyone says Disney has lost all imagination in their parks and can no longer make classic experiences. They are, of course, correct. The parks need WRE. They get yet another Frozen meet and greet. The truly sad part is that guests, for the most part, don't even realize how intellectually cheapened the experience is; or, I suppose, care. I fear the days of great theme park design are gone forever. This series was a fantastic read! As a die-hard Davis fan (and a fan of this blog!) I wholly appreciate your dedication into debunking all these myths and preconceptions about his work (WRE in particular, in this case) and shedding light onto his creations that aren't as widely publicized - as well as painting a beautiful picture of what could have been (the most accurate and believable I've seen yet!). Your point about WDW's Pirates being "abbreviated" to instead compliment WRE is spot-on and something I'm surprised nobody else has brought up. It's a tragedy indeed, when with its intended counterpoint never being built the Florida Pirates' tweaks ended up being pointless and it just ended up being vilified instead. 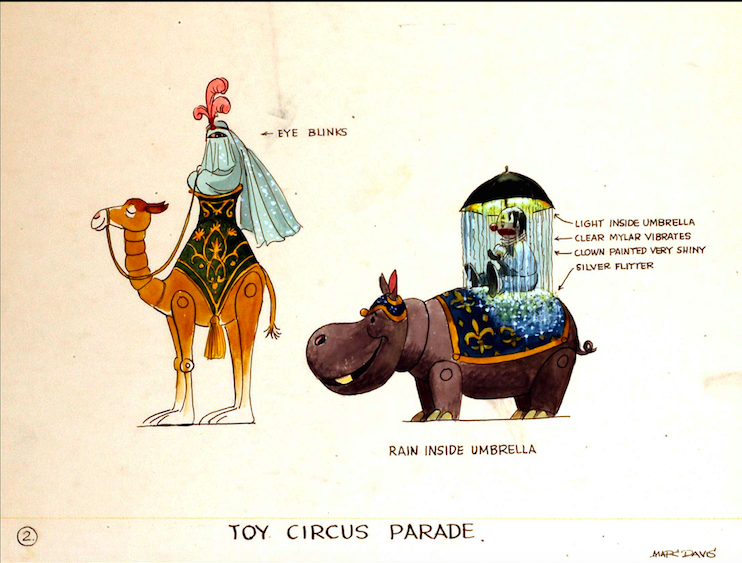 On a separate note, Marc's career in park design after leaving Disney is something that's always intrigued me - I've never heard or seen anything about it beyond the odd context-less concept art like those circus animals. Did any of the projects he worked on after his WED days end up being built, at least with his designs intact? Anyway, thanks for the wonderful articles and keep at it. Hope to read even more in-depth studies of Marc's work from you to come! Amazing work on all three articles. I particularly loved this one and it's look at Marc Davis. The idea that the WDW Pirates didn't just remove certain elements because of costs is one that I hadn't considered in the past. It sheds new light on that ride and make me sad (once again) that we never got to see the Western River Expedition. This isn't quite what I was expecting from your last entry in this series. I was thinking you'd go more in-depth into one of your statements about why Western River Expedition was not built: "[I]t's because Disney didn't want to be in the business of making rides like this past a certain point." Specifically, that was the business of making passive rides that were comedy-based. The second generation of Imagineers - the ones who rose to prominence during this time period - became enamored with rides that were more adventure/experience-based, with the fundamental question driving a ride design being, "What is happening to you [the rider]?" This lead to all sorts of attractions with storylines where the ride environment and its characters had an actual effect on the rider and ride vehicle - the thinking being that this lead to a more active and exciting experience - and is the basis for why so many of these attractions had the same "...and then something goes wrong" plot wherein then the ride became about getting you out of that specific danger or hairy situation. 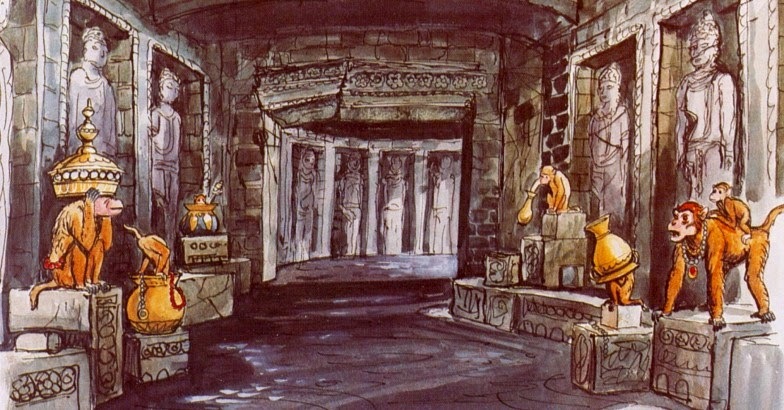 With that sort of philosophy driving attractions, Marc Davis' approach of a setting rides inside lavish, moody worlds and populating them with lightly-connected gags and random, unrelated comic sketches while you ride by passively, as Western River Expedition mostly was, was deemed too old fashioned. It was just too close to those World's Fair diorama rides that people thought were cheesy (Epcot opened with a lot of diorama type rides, and look how many have survived to this day). And this, I think, had as big an effect on the jettisoning of Western River Expedition (for a coaster, no less!) as anything else. For what it's worth, Disney still doesn't make many comedy-based rides. Hence the reason why I thought you made your statement. It's too bad, as I always admired WDI's ability to create these little self-contained vignettes that relied on cleverness to get their point across. (Mystic Manor, the most recent comic-ride, has some of the magic, but the best from modern Disney is the "Randall in the conveyor belt" scene at Tokyo's Monsters Inc). So much of what makes a great Disney attraction are these witty touches. Nowadays, there's a feeling that the wit is gone. A great read from beginning to end. But what about the "leftover" ideas/scenes that resurfaced in other parks and rides? I personally would like to read your thoughts/design criticisms on them. Great finish as I'm a big fan of Marc's work. If only someone in the organization now had the guts to pull off getting this attraction into the parks. I'm with Kirk in that I'd find it interesting to hear your thoughts and analysis on the WRE elements that made it into other attractions like "Listen to the Land" and "Phantom Manor". I'm not aware of any other attractions that incorporated the ideas from the WRE and would love to read about it. I absolutely love the work you put into your blog. Thanks! Brilliant as always. This series on WRE has been amazing. Your writing just gets better and better. Thank you. You have brilliantly brought this attraction to life. 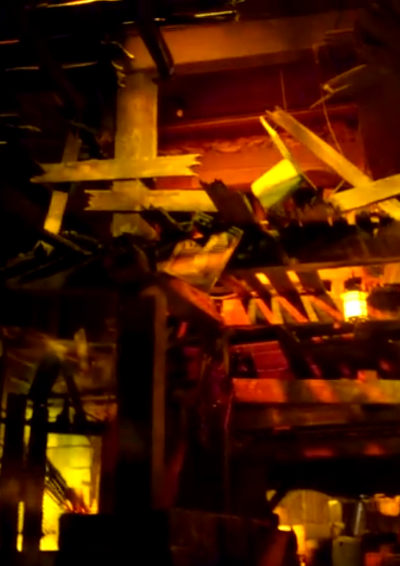 Now WRE is not just blurry fragments of obscure artworks, but an alternate POTC ride we can well imagine. It was surprising the Marc Davis even considered axing the rain dance sequence, doesn't that make the waterfall....and thus, river we are riding, work? I never understood the design choice of stylized Grand Canyon inside the Contemporary Hotel lobby, until you shared Mary Blair's artwork for Western River Expedition. Too good to pass up I guess, especially as the actual attraction was stalling. With IASW exterior not making the transition east, and the tile makers kiln still warm from the Tomorrowland '67 projects, they seem to have decided to use some Mary here. It really worked with the original plexiglass forest of trees. But could this have also hurt the development of the ride complex? "The second generation of Imagineers - the ones who rose to prominence during this time period - became enamored with rides that were more adventure/experience-based, with the fundamental question driving a ride design being, "What is happening to you [the rider]?"" I'd have to know what and to whom you're referring, because it seems to me like after this point, we get a strong trend towards dressed-up thrill rides and dark rides that involve watching vignettes from the movie (or, in Splash Mountain, both). I would argue (as I did here) that this tendency towards watching vignettes from somebody else's story actually disconnects the guest and makes them more passive than the rides you deemed to be "passive." In Pinocchio, Little Mermaid, Phantom Manor, Splash Mountain, etc., the action is directed away from you, towards someone on the stage against whom things are happening. Any engagement seems to come from some novel thrill, like a flume drop or light guns. Those earlier "passive" rides are much more engaging because they direct the action towards the guest... You're flying over Neverland, you're careening through London in Mr. Toad's car, you're being haunted by ghosts, and so on. Successful modern rides do this same thing, regardless of exactly what kind of ride they are, whether the Temple of the Forbidden Eye, Twilight Zone Tower of Terror, 20,000 Leagues Under the Sea and Journey to the Center of the Earth in Tokyo, or Mystic Manor. It's not exactly about the comedy, as it is about who the action is directed towards. Thought-provoking, insightful and important series of articles. Really appreciate it. Especially love your conclusions about how and what Marc decided to put into WDW/Tokyo Pirates based upon the idea that WRE may get done. It's interesting to think about WWHP's The Forbidden Journey, where there's an attempt to make you the star (wasn't that a Universal marketing line at one point?). Yes, Harry and friends are there to start you off and save the day, but for the most part, you are personally experiencing the action, like when you confront the Dementors. It's a hybrid, and it still suffers the repeatability problem of most plot-centered, projection-using rides, but it's interesting to consider how it succeeds, now and in the long-term, and to compare with something like Splash. Excellent series as always Daj. Like a lot of people, I'm also eternally intrigued by the whole 'what if' scenario and continually ponder how the whole WDW would have been shaped had Thunder Mesa had been completely built (as well as the impact on the other parks to 'outdo' their east coast counterpart). I'm also in agreement with others who'd like to know the true epilogue to the story about references today that harken back to WRE (TM at DLP in particular). As always, keep up the great work, you're a true testament to the disneygeek community. Peace. Thank you for this amazing series of posts about the Western River Expedition. Until now, I had always had the general attitude that the WRE would have been pretty cool, but upon reading your posts, it sounds like it would have been AMAZING. Definitely the kind of thing that, back in the day, Disney did best. 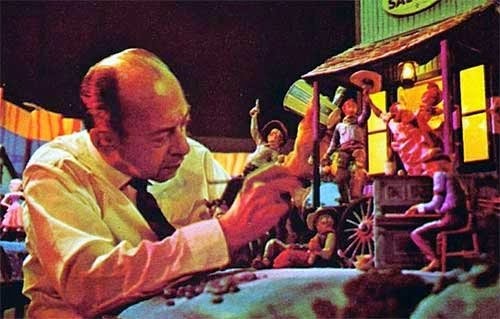 It was fascinating to read about Marc Davis' attention to environment, since I usually think of him as being all about characters, and not really about environment at all ("America Sings", for instance). Claude Coates is one of my Imagineering heroes, I wonder how he would have contributed to the WRE if he and Marc had worked together. What is doubly sad is to think how close they got to actually building this. THANKS for all that you write, I look forward to every post! Fantastic series of articles. Possibly the best treatment of WRE ever put forth, even better than the Baxter presentation he gave at D23 some years back. I'm currently working on recreating the entirety of the 1971 Thunder Mesa complex, complete with WRE in Planet Coaster. I know this article is over two years old, but maybe you can provide me some insight as I build this in-game. Firstly, in regards to "Blue Bayou"-esque restaurant, was intended to wrap around the entirety of the front building facades? That's a mighty large restaurant, even by Disney standards. I'm assuming that a few of the frontal facing facades were utilized for shops, quick-dining options, and maybe another minor attraction. Do you have any information regarding the "town" of Thunder Mesa? Secondly, the path you've given the Mine Cart ride sees it go through a large mountain about mid-way through the attraction. Was this meant to be a sort of drop? Or was it only meant to pop out and around the mountain? Lastly, was there any other attraction planned to be included in the complex? If not in the complex itself, was there any attraction meant to sit alongside Thunder Mesa to compliment it's line-up? I know this is an old post, but enlightenment would be welcome and helpful. I'll be sure to send a link to the project as I progress on it. It doesn't seem to be too unreasonable to expect a number of those buildings to be shops, but I can't offer any more details here because I'm going on the word of somebody who has had better access to the material than I ever did. When the train coaster goes through that large central mountain, that is the "big drop" on that ride. It's a bit easier to see if you check the model and lifework renderings in Part One. So far as I know, I've laid out what the whole intended complex was supposed to be: boat ride, WDWRR diorama, canoe ride, train ride, and hiking trails. The nearest facilities near it would have been the ones that actually got built: the Frontierland depot, and TSI and canoe landings. Thank you for your quick response. I'll be working on this project and it will probably take me a while but I'll send over the results when its complete. Keep up the great work.